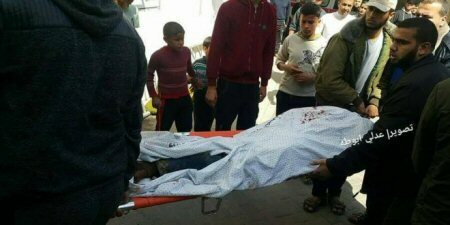 Four people were killed and several others injured, on Saturday, in what initially appeared to be an Israeli artillery attack targeting a group of Palestinians who were riding a three-wheeled “tuk tuk” motorcycle (rickshaw) east of Rafah, in the southern Gaza Strip. Other accounts indicated that the four died in a training accident. The four were identified as Amjad Qartous, 18, Ayed Hamaydeh, 23, Hesham Kallab, 18, and Hesham Abdul-Al, 22. All four were from from the southern Gaza Strip city of Rafah. Islamic Jihad claimed the four young men as fighters in their armed wing, and published a photo of the four wearing the uniform of Islamic Jihad. Initial reports from the PNN stated that Israeli artillery shelled the eastern border of Rafah, targeting a group of young men who were moving rubber tires near the eastern border of the city. But a later report indicted that the four men may have been killed by an explosive that went off in a training accident. The four deaths follow a day of protests at various places along the Israel-Gaza border, in which one Palestinian was killed and 969 Palestinians were wounded . 233 of the wounded were hit by live Israeli fire, and 419 were taken to the hospital. Of the wounded, 20 were women and 67 were under age 18. Dr. Ashraf al-Qadra the spokesman for the Ministry of Health in Gaza said that 4 Palestinians were killed & several others wounded in the incident on Saturday, adding that the slain and injured were taken to Abu Yousef al-Najjar hospital.